http://indie-rpgs.com/archive/index.php?topic=12796.0 Not much here other than a broken link to a game. http://indie-rpgs.com/archive/index.php?topic=8572.0 A dice mechanic primer. I don't think there's anything here I'll use. http://indie-rpgs.com/archive/index.php?topic=23579.0 An old Psi Run thread from 2007. I love the version of Psi Run that was just released. The post is about using questions as traits and controlling the power level of the characters' powers. This gives me some ideas. Also, I'm thinking of a similar die system to what Psi Run uses, though that's not mentioned in this thread. I just like Psi Run's die mechanic idea. http://indie-rpgs.com/archive/index.php?topic=4262.0 Working on a narrativist premise for a game. Also talks about having the characters' actions affect the level of opposition in the game. I think I can do something with that second bit. As for ingredients, I like all four, though I think lantern may only be a minor reference, really, rather than a core element. After thinking on it at work for a couple days, here's what I've come up with. * The characters are troubleshooters for an interplanetary agency, sent in to resolve problems when things get really, really bad. Terrorist situations, natural disasters, and so on. The characters are all powerful and capable right from the start, no zero to hero. May or may not be a character improvement system. Or maybe it'll be a sort of 'lateral improvement' system. Not sure yet. Players choose from three base character types, then customize them to suit what they want to play. The types are: Uplifted dog-humanoids (nicknamed Coyotes) created to serve as combat forces and scouts; An artificial lifeform called a Mimic, capable of adapting to environments and situations on the fly; and a human scientific, engineering, or medical expert (usually called Docs) who is probably in charge. * The agency is named LANTERN (Local Authority Node Troubleshooter Emergency Response Network), the special operations arm of the government. * Each problem would be intended to run as a single session, and difficult enough to push the characters to (or beyond) their limits, with a possibility of death, particularly if the mission is failed. * Doom clock. I think this may be how the players interact with the difficulty of the opposition. At the start of the session, the Doom Clock has X hours left. As time passes in the game, the clock counts down (maybe in game time, maybe losing an hour per scene or something). The players need to resolve things positively before time runs out. Some scenes are Doom scenes, and will affect the doom clock directly. If the PCs succeed during the scene, the clock goes back up an hour or more. If they fail, it counts down. Something like that. I'm thinking that the GM would state at the start of the scene that it's a doom scene and indicate what success and failure will mean to indicate the importance of what the players are about to attempt. If the doom clock every hits 0, the bad stuff happens. Hostages are shot, the asteroid hits the planet, or whatever. The PCs, if they survive, are probably in bad shape. Maybe failure at that point means death or other forms of permanent removal. Maybe the PCs can make a sacrifice play and die making the failure less bad for those they were trying to protect (if you want a more heroic and less depressing game). 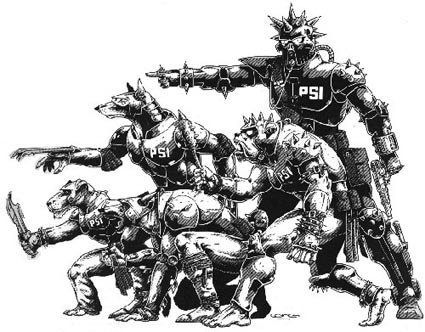 * The PCs are, to some degree, owned by LANTERN, who funds the creation of the Coyotes and Mimics and trains the agents. They're sent in knowing they may not make it back out, as they're only sent in when nothing else has worked. They're the last chance. * Powers: I want a high-drama, high-action, high-tension feel, I think. Like some of the better dramatic action movies. Coyotes will have the ability to boost their physical abilities, strength, speed, endurance, but if they push them too far it will cause self-injury or physical aggravation. Mimics can adapt, and may have some sort of psychic ability, but can become exhausted. Scientist types will be the skill-focussed ones. No superhuman powers other than maybe cybernetic brain enhancement. * System-wise, I'm thinking resolution will be kinda similar to Psi-Run. When a character tries to do something, they roll four D6s and assign the dice to different aspects of the action, similar to Psi-Run. Instead of the charts Psi-Run uses, though, the player will put each die next to a skill set or trait on their sheet. These might be Close in Combat, Shooting, Tracking, Sneaking, Dodge, Move Safely, Medicine, Engineering, and similar. Each has a modifier from +0 to +2, which is added to the die result for that aspect of the action. The GM never rolls anything, so the NPCs just have difficulty ratings for their traits. If the PC's die total is at least as high as the NPC's (or the situation's ratings, for environmental events), the PC succeeds at that. For instance, a PC and NPC are engaged in combat. The player rolls dice and assigns a 6 to their Shooting +1, for a 7, and a 3 to their Dodge +0, for a 3 total. The enemy agent has Shooting 4 and Dodge 4. The PC's Shooting of 7 beats the NPC's Dodge of 4, so they hit. The PC's Dodge of 3 fails to equal or exceed the NPC's Shooting of 4, so they get hit in return. Something along those lines. Scenes would probably be more like Lady Blackbird, rather than structured rounds of back-and-forth combat. If the player had fewer than 4 aspects to their action, they just assign a die to each thing and discard the rest. 4 aspects should be enough for most actions. * Narration rights. I may add a fifth die, distinct from the others, to say who narrates the results of the action, separate from determining the success of the action. Or maybe the lowest die you rolled determines it, with odd meaning the player narrates and even meaning the GM/opposing player (in a pvp situation) narrates. Maybe either side can spend a bennie to make an alteration to the narration (yes, but or yes, and?). * Character questions: I like the idea of character questions, but I'm thinking in this game they may be almost like a bennie themselves. Maybe you come up with a few questions when creating the character, such as 'What did I do to save Triton Station last year,' or 'What secret am I keeping from the other characters?' At an appropriate point during the session, a player can answer one of their questions in a way that is appropriate to the current scene. This gives them a big bonus to resolving the scene and they write the answer down on their sheet. From now on it gives a +1 bonus to appropriate situations. Basically, they build their past during play by coming up with flashbacks. Once a question is answered, it cannot be answered again. Maybe you get a new question if you survive the session and that's the character improvement method. Maybe questions should be from a standardized list? * Equipment: No lists of gear. You have what is appropriate to you as an experienced and highly capable agent for an interplanetary agency that has a massive budget. * Bennies: Not sure of a good descriptive name, but they'll probably be used mainly as a straight bonus to a die. I'm thinking you start with only a couple and get more by either failing an action (giving you 1 per failed aspect) or by doing really well, by getting multiple 6s on the roll (giving you 1 for each 6 rolled after the first). * Effects of damage/failure: Probably negative traits added to the character. Maybe they penalize rolls or you roll extra dice and take the lowest 4 or something. Not sure yet. Anyway, that's the initial braindump. It's still somewhat traditional, but I'm trying to expand beyond what I normally put into a game design. In the end, I have Coyote, Mimic, and the last two threads I listed as primary ingredients. Lantern and doctor are there in name, and may be dropped to get down to four, if everything else stays. Hope everyone else is having fun with theirs. I'm quite enjoying it this year. Do you see the character questions being applicable to internal character conflicts? Such as dealing with the reality of being an engineered and owned super soldier and how a PC might feel about that? I could see the questions possibly working like that. I was thinking last night that maybe the character has a number of questions, one made up by the player, and one more from each other player and the GM, representing what they want to find out about the character, or something like that. Almost an inverse of Psi Run (where the player comes up with this questions, but they're answered by the other players, if I remember correctly). If you think someone's coyote character might have some internal conflict, that could be your question to them, written down on their sheet and answered at an appropriate moment. An idea, anyway. Gotta think on it more. Thanks muchly for the interest. After some thinking, I'm going to switch Mimics to be the villains, aliens (or possibly a former experiment?) who are trying to rid the planet of humans for some reason that they've never explained. Something like a cross between The Thing and the New Cylons. Still working that out. Also, I think I'm going to merge the questions and the bennies. Answering your questions in a way that helps the current scene is the way you affect dice rolls. After that, it becomes a permanent +1 to appropriate rolls. There will probably be two fixed questions for each character ('Are you a Mimic?' and either 'What do you think of artificial lifeforms?' or 'What do you think of being an artificial lifeform? '), with the player and the GM each making up an additional one. When a question is answered, he answer is written down in a separate area, and the question gets replaced with a new one at the end of the session (if the game is continuing and the character survived). Also going to drop the Lantern term, leaving me one more element to drop to get down to 4. Coyote, Mimic, and one of the threads are definitely staying. Well, went and changed things a bunch at almost the last minute (including the title, which is now Last Chance), but it's done. Slightly long, but done. Hope everyone's having a good night. I'm off to work.